Low Water Levels Caused By A Drought Reveal 400-Year-Old Church! 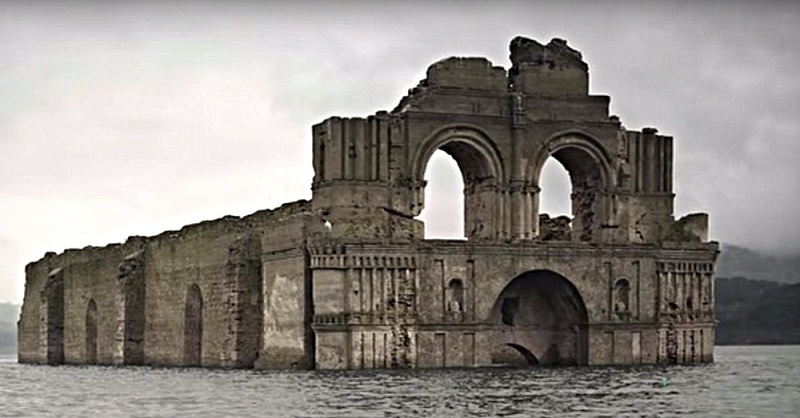 The Nezahualcoyotl reservoir in Mexico has recently dropped more than 80 feet, revealing the ruins of a 16th-century church for the first time since 2002. The Temple of Quechula, otherwise known as the Temple of Santiago, was built in 1564, but was abandoned nearly 200 years later when plagues ravished the area. The church wasn’t fully submerged in water until 1966, when a nearby dam was built. In 2002, the water levels dropped so low that people could actually walk inside the temple! We’ve seen stories like this before, yet to see the Temple of Santiago still standing after being submerged in water is really quite extraordinary; see for yourself in the following clip from the New York Daily News.